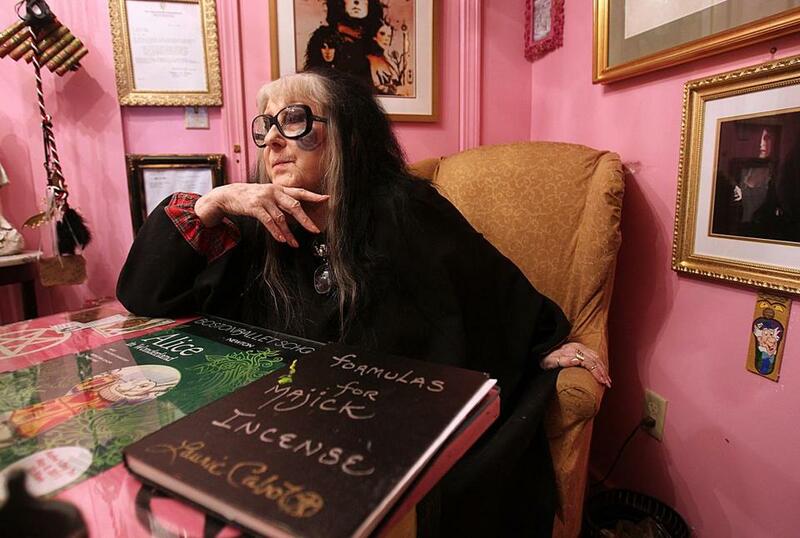 Laurie Cabot, at her shop, was declared the official witch of Salem by Governor Michael Dukakis in 1977. SALEM - For roughly 17 years, Salem’s Pickering Wharf was the Graceland of witchcraft and Laurie Cabot its Elvis. “It was just constant lines waiting to get in to see her and she signed her books,’’ said Ginny Goldsmith, who owns Crafters Market, across from Cabot’s Official Witch Shoppe. Cabot, who opened Salem’s first witch shop about 40 years ago on Derby Street, locked her doors at 63R Wharf St. on Tuesday for good. But the 79-year-old is not retiring. “The online store is doing great, and it’s worldwide,’’ said Cabot, who began selling her homemade merchandise such as bags of incense ($4.50) and bottles of potions ($17.50) online last year. “It’s definitely a beginning; it’s exciting, really,’’ she said during an interview last week from her store’s back room, where she does healings and psychic readings in a black caftan, oversized black glasses, and black eye makeup. Cabot said tourism in the Witch City has dipped to the point where a brick-and-mortar store is no longer sustainable. Born in 1933 in Wewoka, Okla., while her parents were en route to California, Cabot says she first experienced psychic abilities when she had a vision of a boy falling off his bicycle onto a train trestle. The 7-year-old’s mother called the sheriff and the boy was rescued, Cabot said. Four years later, Cabot’s mother split from her husband and moved her daughter back to her native Boston, where they met a woman at the Boston Public Library who claimed to be a witch. Cabot studied under the woman until she was 16 but eventually started dancing at Lou Walters’ (Barbara Walters’ father) Latin Quarter nightclub. Cabot didn’t practice witchcraft openly until shortly after she found herself a 30-year-old divorcee with two young children, in the late 1960s. But she concealed her religion again after a friend urged her to move into a Federal-style house across the street from the mayor of Salem in 1969. She maintained her anonymity until her black cat was stuck in a three-story tree for three days. Cabot says she called the police and fire departments, only to be told it was against their union rules to rescue cats. When the Animal Rescue League refused to help, Cabot called the local paper. “By then I was frantic. . . . I said, ‘look, I’m a witch and that’s my particular and I want her down now,’ ’’ Cabot recalled, referring to a witch term meaning the cat was necessary for her rituals. The cat was rescued in short order but she says a newspaper picture of her clutching the cat went viral when news wire services ran it. Officially out of the broom closet, Cabot says she appeared on several national talk shows, including the “Tonight Show’’ with Johnny Carson. Cabot, who has taught witchcraft at Salem State College, Wellesley College, and Harvard, still had to educate customers before she could build a clientele. She preached that witchcraft, or the Wiccan religion, combines magic, astrology, and environmentalism in a scientific manner. With the store closed, Cabot’s dream is to once again attract witches from all over the world to the North Shore by creating a building for her Cabot Kent Hermetic Temple, which received 501(c)(3) nonprofit status in 2010.